Haypi Adventure – Kingdom of Glory is an iOS game developed by Haypi Co. Set in the Age of Discovery, Haypi Adventure is an addictive blend of base building, defense and offense. 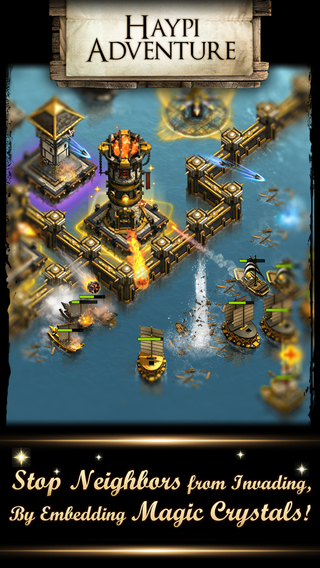 In Haypi Adventure, you take control of your own sea-faring civilisation and build a defensive home-base to grow into an island fortress. Collect silver, timber and iron via the construction of Wood Mills, Forges and Silver Mints. 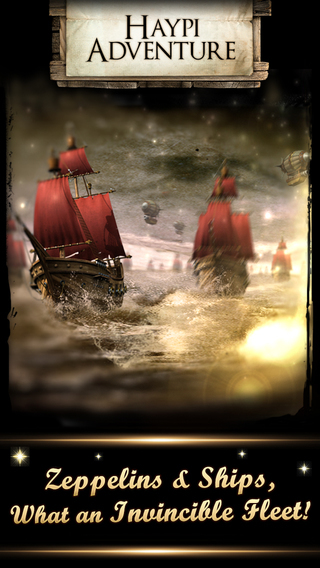 Use your resources to construct defensive structures such as the Turret and Shark Nest or to create a fleet of ships to attack other players. Your town initially consists of a number of basic buildings, including the Town Hall, Tech Centre and Warehouse. The Town Hall’s upgrades are linked to production, including the number of workers. As in similar games, the Tech Centre is where you can gain upgrades and boosts to buildings, resource collection, tactics, ships and more. Your Warehouse stores your collected silver, wood and iron with the ability to protect your resources against enemy plunder. The Shipyard allows you to build offensive ships – everything from the humble Cog right up to the Longship, Fireball and Zeppelin. 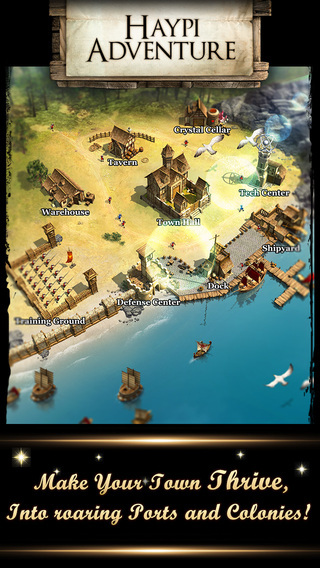 There are other buildings as well, including a Defense Centre, Training Ground, Tavern and Crystal Cellar which are not available at the start of the game but are unlocked as you progress through Haypi Adventure – Kingdom of Glory. The combat side of the game is where Haypi Adventure gets interesting. You can battle with the ‘Panic Pirates’ from the very beginning, but player-vs-player combat is unlocked when you reach level 9. You can recruit Heroes to your cause, level them up and also create ‘Teams’ with which you can launch attacks on other home bases. An immersive game with the right mix of offsensive and defensive play, Haypi Adventure – Kingdom of Glory offers up something different in a crowded market of base-building multiplayer titles. Haypi Adventure – Kingdom of Glory requires iOS 6.0 or later. Compatible with iPhone, iPad, and iPod touch.